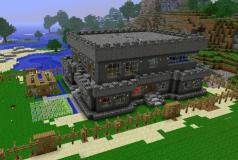 Minecraft is a highly popular game that gives players the freedom of doing lots of different things in an open world. The game is about placing and removing blocks, but you can play it in various styles, depending on your favorite activities. You can explore the world with your friends, fight dangerous enemies, farm, mine…etc. all in a virtually endless randomly generated universe. Between the main world there are two dimensions: The Nether, a dark hell-like place holding both dangers and valuable resources and The End, a desolate land where you can fight the Ender Dragon dwells. Minecraft is a flexible game that can be played in several modes: creative, survival, adventure and multiplayer (using player-hosted servers). Also, multiple players connected to the same network can join a single player world without needing a server, as Minecraft has LAN support.